The Word “Prabhupada” is a term of the utmost reverence in Vedic religious circles. It signifies a great saint even among saints. The word actually has two meanings: first, one at whose feet (pada) there are many prabhus (a term meaning “master” that the disciples of a guru use in addressing one another); second, one who is always found at the lotus feet of Krishna (the supreme master). In the line of disciplic succession through which Krishna consciousness is conveyed to mankind, there have been a number of figures of such spiritual importance as to be called Prabhupada. Srila Rupa Gosvami Prabhupada executed the will of his master, Sri Caitanya Mahaprabhu, and therefore he and his associate Gosvamis are called Prabhupada. Srila Bhaktisiddhanta Sarasvati Gosvami Thakura executed the will of Srila Bhaktivinoda Thakura, and therefore he is also addressed as Prabhupada. Our spiritual master, Om Visnupada 108 Sri Srimad Bhaktivedanta Swami Maharaja, has in the same way executed the will of Srila Bhaktisiddhanta Sarasvati Gosvami Prabhupada in carrying the message of love of Krishna to the western world. 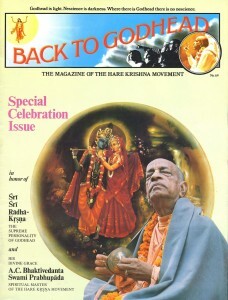 Therefore, following in the footsteps of Srila Rupa Gosvami Prabhupada, we, the humble servants of His Divine Grace from all the different centers of the sankirtana movement in North America, South America, Europe, Africa, Asia and Australia, prefer to address His Grace our spiritual master as Prabhupada. We have asked if we may have his permission to do so, and he has kindly said yes.